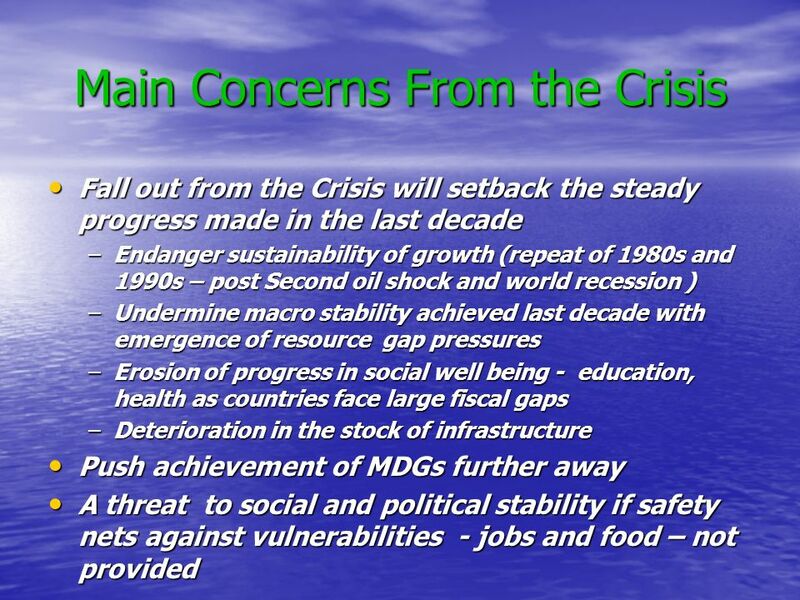 Crisis in the International System and Africas Development Benno Ndulu Bank of Tanzania. 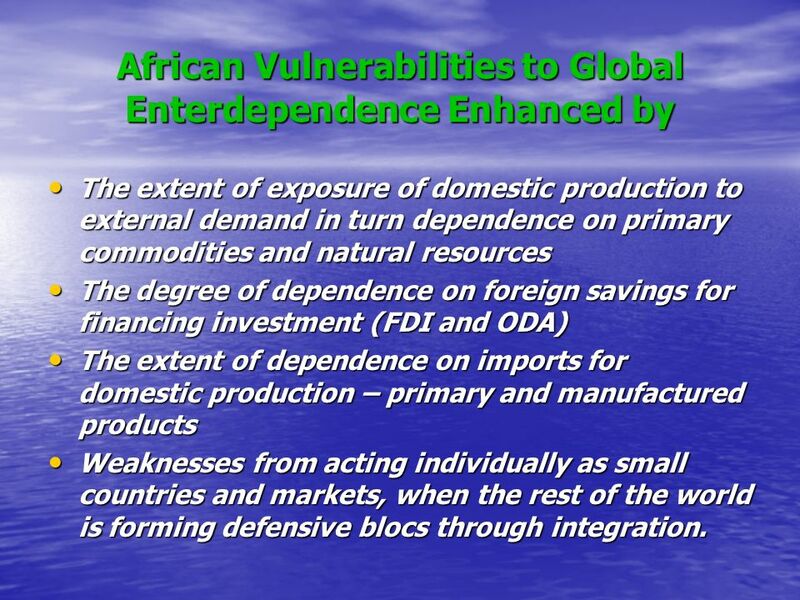 5 African Vulnerabilities to Global Enterdependence Enhanced by The extent of exposure of domestic production to external demand in turn dependence on primary commodities and natural resources The extent of exposure of domestic production to external demand in turn dependence on primary commodities and natural resources The degree of dependence on foreign savings for financing investment (FDI and ODA) The degree of dependence on foreign savings for financing investment (FDI and ODA) The extent of dependence on imports for domestic production – primary and manufactured products The extent of dependence on imports for domestic production – primary and manufactured products Weaknesses from acting individually as small countries and markets, when the rest of the world is forming defensive blocs through integration. 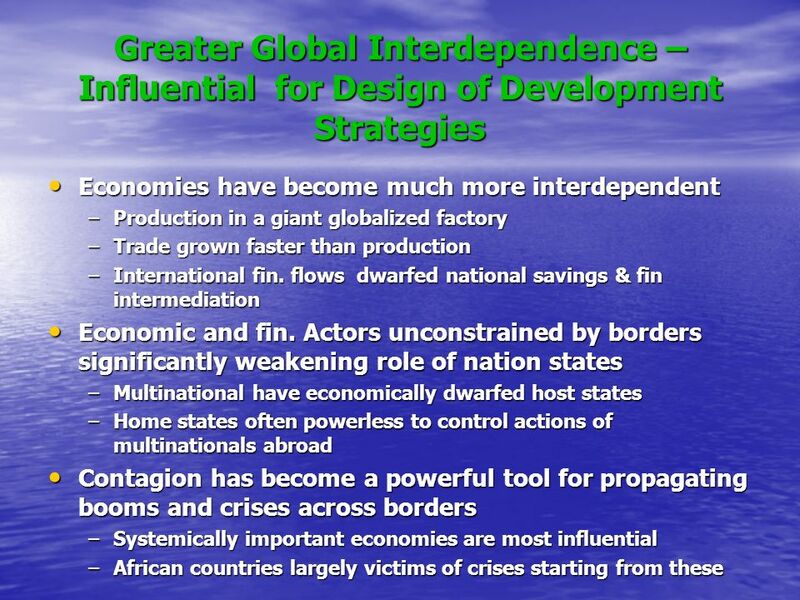 Weaknesses from acting individually as small countries and markets, when the rest of the world is forming defensive blocs through integration. 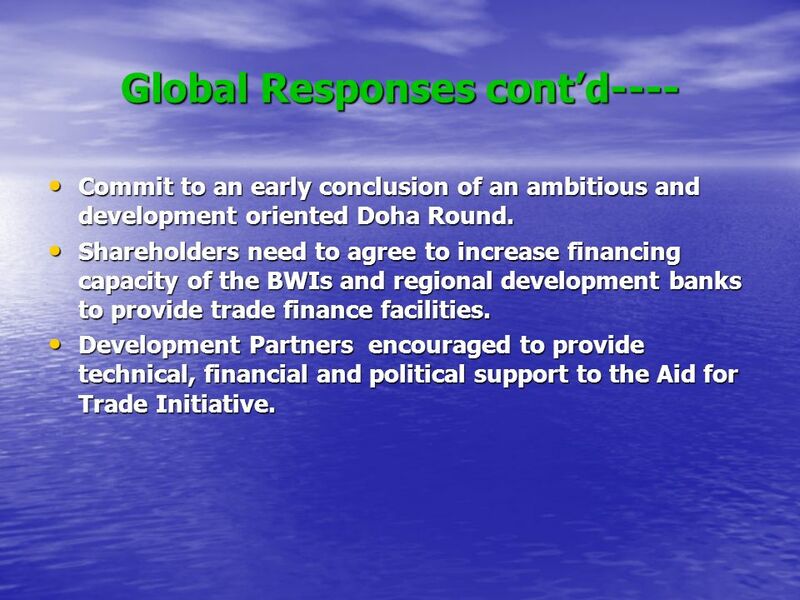 11 Global Responses contd---- Commit to an early conclusion of an ambitious and development oriented Doha Round. Commit to an early conclusion of an ambitious and development oriented Doha Round. Shareholders need to agree to increase financing capacity of the BWIs and regional development banks to provide trade finance facilities. Shareholders need to agree to increase financing capacity of the BWIs and regional development banks to provide trade finance facilities. 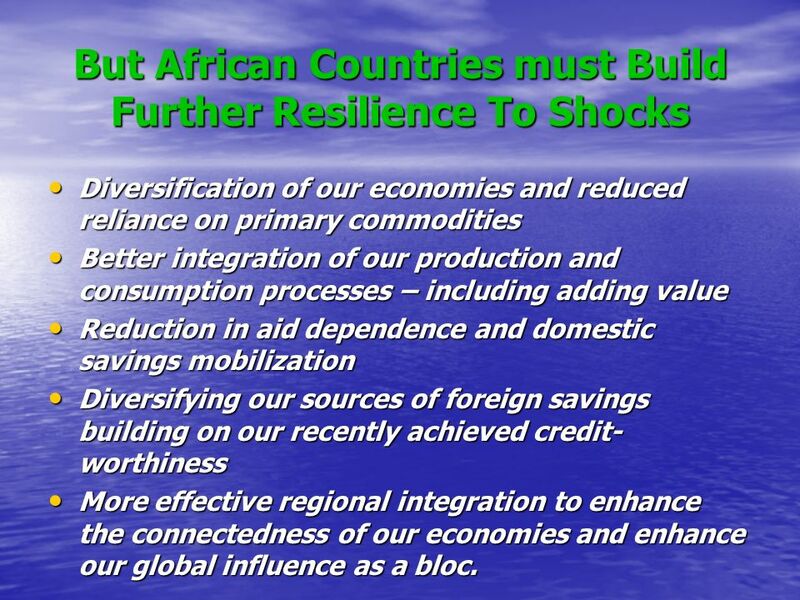 Development Partners encouraged to provide technical, financial and political support to the Aid for Trade Initiative. 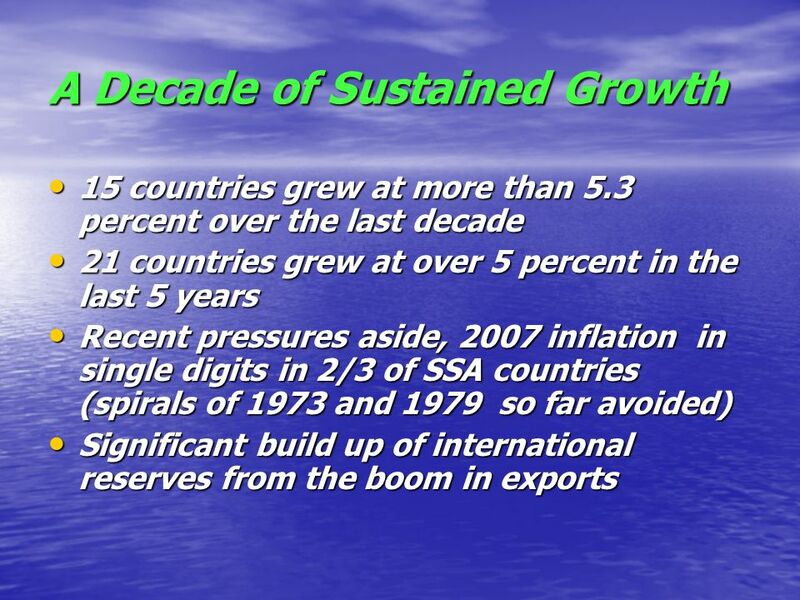 Development Partners encouraged to provide technical, financial and political support to the Aid for Trade Initiative. 13 But African Countries must Build Further Resilience To Shocks Diversification of our economies and reduced reliance on primary commodities Diversification of our economies and reduced reliance on primary commodities Better integration of our production and consumption processes – including adding value Better integration of our production and consumption processes – including adding value Reduction in aid dependence and domestic savings mobilization Reduction in aid dependence and domestic savings mobilization Diversifying our sources of foreign savings building on our recently achieved credit- worthiness Diversifying our sources of foreign savings building on our recently achieved credit- worthiness More effective regional integration to enhance the connectedness of our economies and enhance our global influence as a bloc. 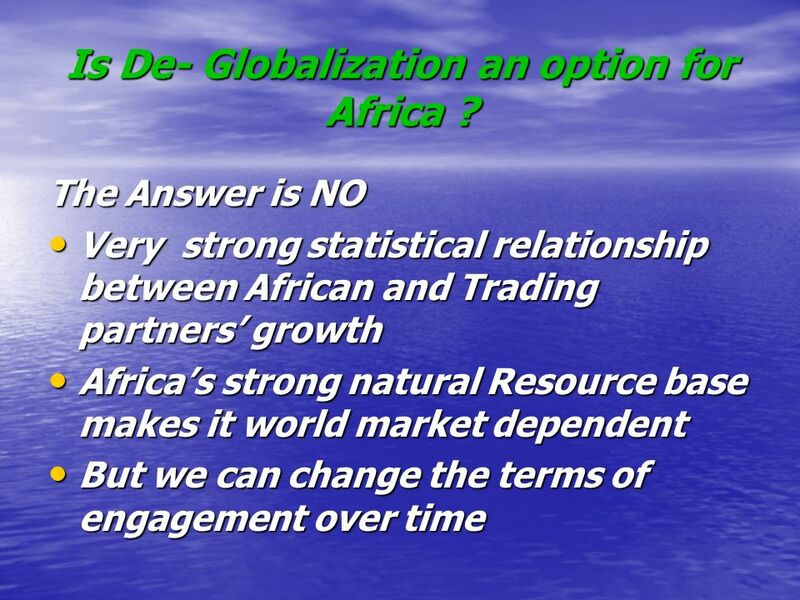 More effective regional integration to enhance the connectedness of our economies and enhance our global influence as a bloc. 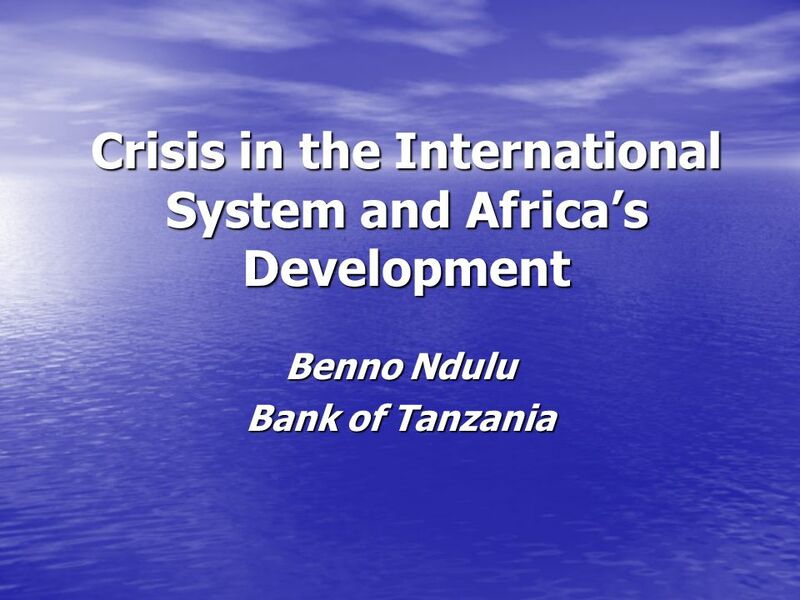 Download ppt "Crisis in the International System and Africas Development Benno Ndulu Bank of Tanzania." Moving Out of Aid Dependency Michael Atingi-Ego 2 nd Committee Panel Discussion United Nations, New York 16 November 2007. 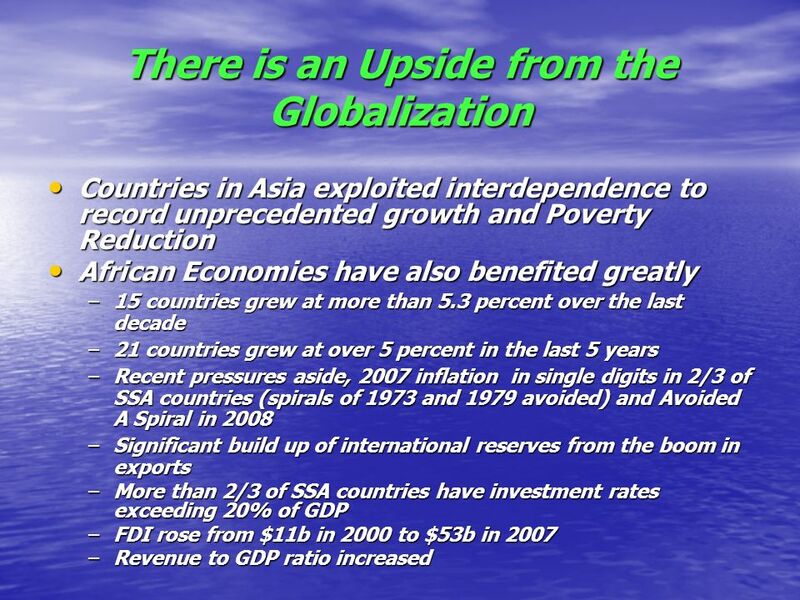 OVERVIEW OF RECENT ECONOMIC AND SOCIAL DEVELOPMENTS IN AFRICA Adam ElHiraika, Director, Macroeconomic Policy Division (MPD), UNECA. Recent Developments in the Region and Macedonia Opening of the NBRM-WB PIC Alexander Tieman 16 December, 2010. 1 UNECA Louis Kasekende Chief Economist African Development Bank 27 June 2008 UNECA. Maintaining Macroeconomic Stability in Turbulent Times: The Case of Macedonia Maintaining Macroeconomic Stability in Turbulent Times: The Case of Macedonia. 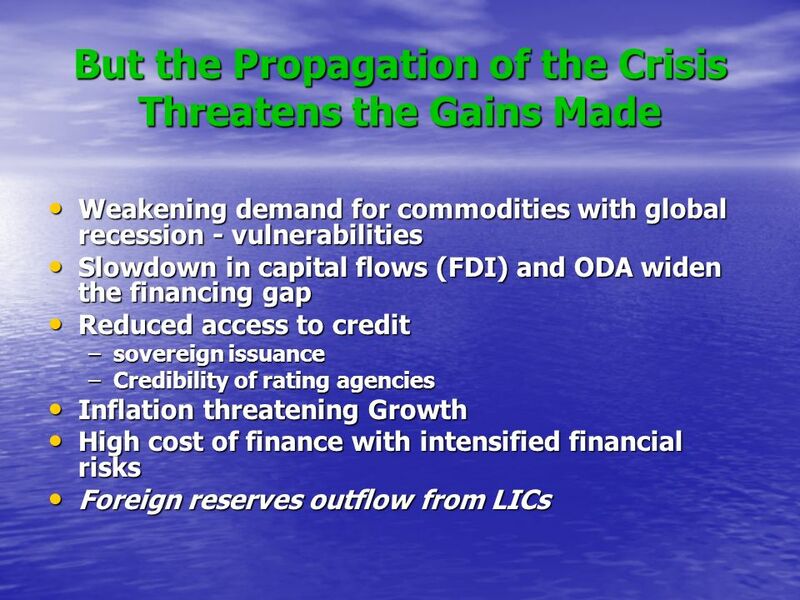 The Financial Crisis and The Future of Financial Globalization Gian Maria Milesi-Ferretti International Monetary Fund, Research Dept. and CEPR. THE GREAT RECESSION AND THE DEVELOPING WORLD JOSÉ ANTONIO OCAMPO COLUMBIA UNIVERSITY. 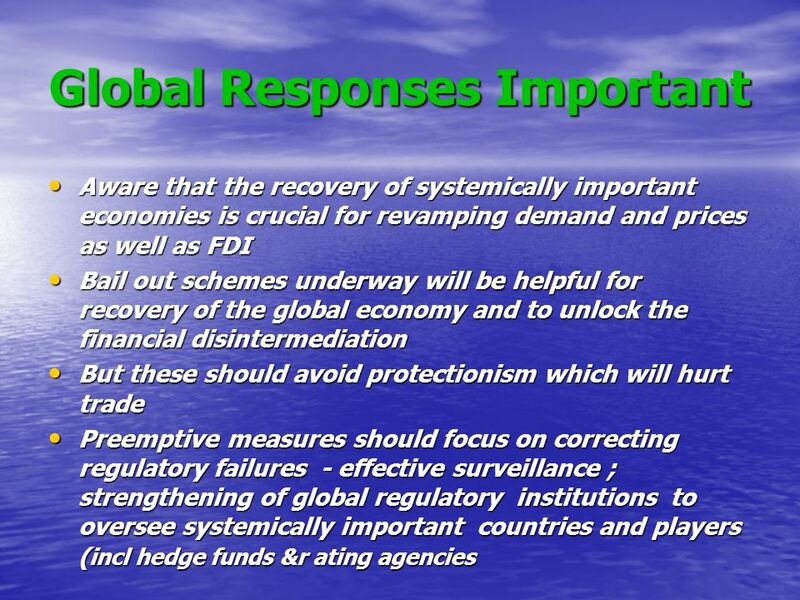 Key Policies Improving Business and Investment Climate Presenter: Governor CBBH: Kemal Kozarić, MA. Lecture 3: Emerging Markets and Elements of Country Risk Analysis. Copyright © 2011 Pearson Addison-Wesley. All rights reserved. 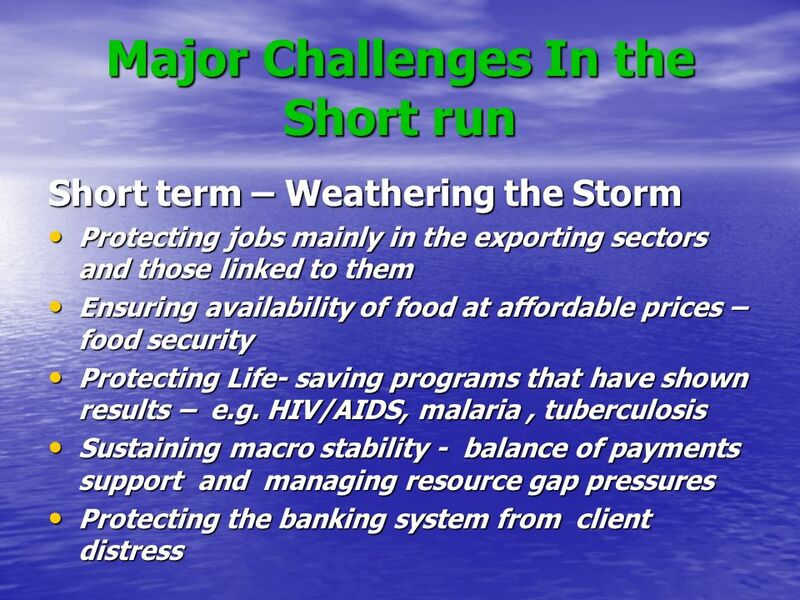 Chapter 9 Trade and the Balance of Payments. 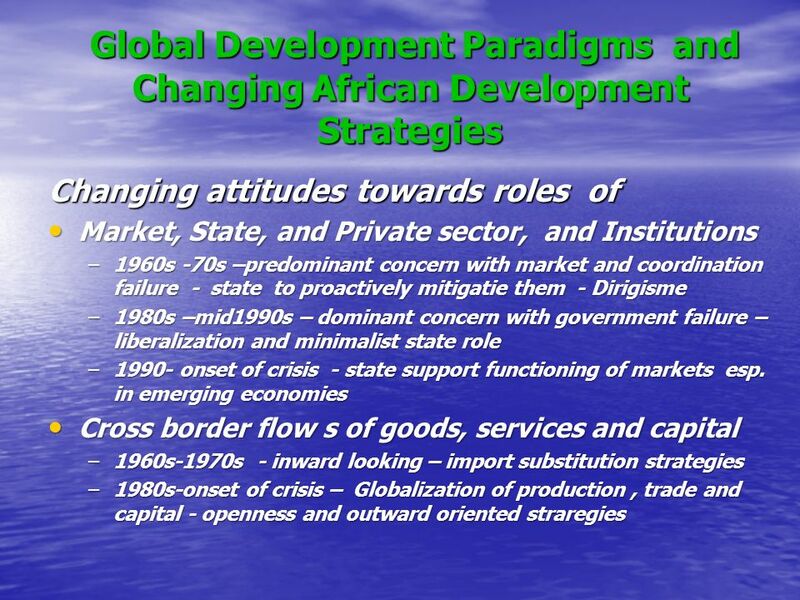 Chapter 14 Foreign Finance, Investment, Aid, and Conflict: Controversies and Opportunities.